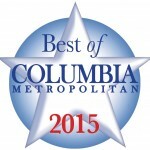 A big thank you to the readers of Columbia Metropolitan Magazine for voting Mr. Friendly’s the BEST WAIT STAFF! The magazine recently released their annual “Best Of” edition, and we are very proud to be chosen as we strive to be the most dedicated service industry professionals in Columbia! Columbia Metropolitan Magazine has been polling its readers for over 20 years, to find out their top picks in all sorts of categories, not just restaurants. To see the entire list of winners, please click here!